New terminal ... gets long-awaited go-ahead. Kuwait’s government said it had awarded a contract to build a new terminal at the country’s international airport to the same consortium that had its earlier more-expensive bid dismissed. 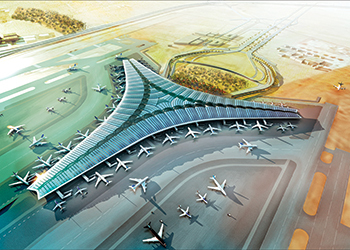 Turkey’s Limak Holding and local construction firm Kharafi National won the deal after bidding KD1.312 billion ($4.34 billion) for the work at Kuwait International Airport – KD74 million ($244 million) cheaper than the offer it submitted in November. The government dismissed all bids proffered in November without explanation – though Kuwait’s Al Watan newspaper quoted ministry sources saying they had been too expensive and had not met technical specifications. The government’s Central Tenders Committee said late last month the Limak-Kharafi consortium had submitted the lowest bid during the re-tendering process. The new terminal building will initially have a capacity of 13 million passengers and will be expanded to have a 25-million passenger capacity in the future, according Limak Holding. Limak Insaat, the construction unit of Limak Holding will provide repair and maintenance services in the two years after it completes and transfers the building, the financing of which will be held by the Kuwait state. The company will also manage the operational transition process of the terminal following the construction period. This tender is the largest undertaken by a Turkish construction company abroad in one package, according to the company. Around 5,000 people will be employed in the construction project.